Cognitive and social factors are essential considerations in inflammatory bowel disease (IBD) patient management, but existing research is limited. This study aims to expand the IBD literature by examining the relationship between social supports and QoL, while examining mechanisms in these relationships. Consenting patients attending an IBD outpatient clinic were provided a survey package (N = 164). Regressions evaluated predictors of IBD-QoL, and catastrophizing and optimism were examined as mediators between social support and IBD-QoL. Diminished IBD-QoL was predicted by younger age, greater negative spousal responses, and less perceived spousal support. Mediation models showed helplessness catastrophizing to be the lone mediator, acting as a mechanism between both negative spousal responses and perceived spousal support with IBD-QoL. Social interaction variables are associated with IBD-QoL, but patients’ experience of helplessness acts to reduce their ability to benefit from social support. Patient care should consider supportive social and cognitive factors to improve IBD-QoL. Michael Beyak is supported by an award by the Clinical Teaching Association of Queen’s University—Endowment Fund Career Development Award. Stephen Vanner is supported by an operating grant from the Crohn’s and Colitis Foundation of Canada (CCFC). Laura Katz, Dean A. Tripp, Mark Ropeleski, William Depew, J. Curtis Nickel, Stephen Vanner and Michael J. Beyak declare that they have no conflict of interest. Bernstein, C. N., Wajda, A., Svenson, L. W., MacKenzie, A., Koehoorn, M., Jackson, M., … Blanchard, J. F. (2006). The epidemiology of inflammatory bowel disease in Canada: A population-based study. American Journal of Gastroenterology, 101(7), 1559–1568. doi: 10.1111/j.1572-0241.2006.00603.x. Blondel-Kucharski, F., Chircop, C., Marquis, P., Cortot, A., Baron, F., Gendre, J., … GETAI., (2001). Health-related quality of life in Crohn’s Disease: A prospective longitudinal study in 231 patients. The American Journal of Gastroenterology, 96(10), 2915–2920. doi: 10.1111/j.1572-0241.2001.4681_b.x. Boye, B., Lundin, K. E. A., Jantschek, G., Leganger, S., Mokleby, K., Tangen, T., … Jahnsen, J. (2011). INSPIRE Study: Does stress management improve the course of inflammatory bowel disease and disease-specific quality of life in distressed patients with ulcerative colitis or crohn’s disease? A randomized controlled trial. Inflammatory Bowel Disease, 17(9), 1863–1873. doi: 10.1002/ibd.21575. Graff, L. A., Walker, J. R., Lix, L., Clara, I., Rawsthorne, P., Rogala, L., … Bernstein, C. N. (2006). The relationship of inflammatory bowel disease type and activity to psychological fuctioning and quality of life. Clinical Gastroenterology & Hepatology, 4(12), 1491–1501. doi: 10.1016/j.cgh.2006.09.027. Keefe, F. J., Blumenthal, J., Baucom, D., Affleck, G., Waugh, R., Caldwell, D. S., … Lefebvre, J. (2004). Effects of spouse-assisted coping skills training and exercise training in patients with osteoarthritic knee pain: A randomized controlled study. Pain, 110(3), 539–549. doi: 10.1016/j.pain.2004.03.022. Lix, L. M., Graff, L. A., Walker, J. R., Clara, I., Rawsthorne, P., Rogala, L., … Bernstein, C. N. (2008). Longitudinal study of quality of life and psychological functioning for active, fluctuating, and inactive disease patterns in inflammatory bowel disease. Inflammatory Bowel Disease, 14(11), 1575–1584. doi: 10.1002/ibd.20511. Nickel, J. C., Tripp, D., Chuai, S., Litwin, M. S., McNaughton-Collins, M., Landis, J. R., … Kusek, J. (2008). 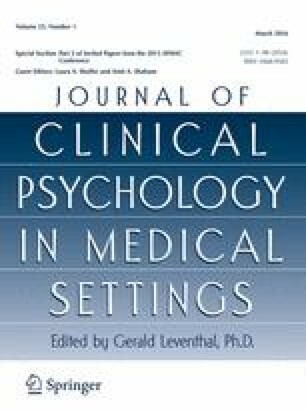 Psychosocial variables affect the quality of life of men diagnosed with chronic prostatitis/chronic pelvic pain syndrome. British Journal of Urology International, 101(1), 59–64. doi: 10.1111/j.1464-410X.2007.07196.x. Parikh, S. V., Lam R. W., & CANMAT Depression Work Group. (2001). Clinical guidelines for the treatment of depressive disorders, I. Definitions, prevalence, and health burden. Canadian Journal of Psychiatry, 46(Supp1), 13S–20S. doi: 10.1016/j.jad.2009.06.044. Schirbel, A., Reichert, A., Roll, S., Baumgart, D. C., Buning, C., Wittig, B., … Sturm, A. (2010). Impact of pain on health-related quality of life in patients with inflammatory bowel disease. World Journal of Gastroenterology, 16(25), 3168–3177. doi: 10.3748/wjg.v16.i25.3168. Seres, G., Kovacs, Z., Kovacs, A., Kerekgyarto, O., Sardi, K., Demeter, P., … Tury, F. (2008). Different associations of health related quality of life with pain, psychological distress and coping strategies in patients with irritable bowel syndrome and inflammatory bowel disorder. Journal of Clinical Psychology in Medical Settings, 15(287–295), 287. doi: 10.1007/s10880-008-9132-9. Sewitch, M. J., Abrahamowicz, M., Bitton, A., Daly, D., Wild, G., Cohen, A., … Dobkin, P. L. (2001). Psychological distress, social support, and disease activity in patients with inflammatory bowel disease. The American Journal of Gastroenterology, 96(5), 1470–1479. doi: 10.1111/j.1572-0241.2001.03800.x. Tripp, D. A., Nickel, J. C., Wang, Y., Litwin, M. S., McNaughton-Collins, M., Landis, J. R., … Kusek, J. W. (2006). Catastrophizing and pain-contingent rest predict patient adjustment in men with chronic prostatitis/chronic pelvic pain syndrome. The Journal of Pain, 7(10), 697–708. doi: 10.1016/j.jpain.2006.03.006. Wright, M. A., Wren, A. A., Somers, T. J., Goetz, M. C., Fras, A. M., Huh, B. K., … Keefe, F. (2011). Pain acceptance, hope, and optimism: Relationships to pain and adjustment in patients with chronic musculoskeletal pain. The Journal of Pain, 12(11), 1155–1162. doi: 10.1016/j.jpain.2011.06.002.